January, 1959. To the delight of Cubans, Fidel Castro marches into Havana, overthrowing Batista and basking in the cheers of his countrymen. 17-year-old Sonya, a budding artist, supports him completely. She gives up thoughts of making a living as a painting to train as a surgeon, a job which will be of more benefit for the revolution. What follows is a nightmare tale of the betrayal of principles, of a regime which goes bad, and of the loss of hope. Part of me is wondering whether this is really suitable for a site which is meant to specialise in YA books, to be honest - this certainly isn't aimed at younger readers. Sonya is tortured at one point and. while it's never explicit, both the text and art are absolutely brutal in these scenes. That said, it's such an enlightening book that I wouldn't hesitate to recommend it to more mature teenagers with an interest in history who want to find out more about Cuba. It's based on writer Inverna Lockpez's own experiences and feels utterly authentic. 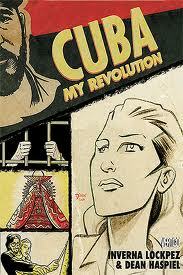 The artwork, by Dean Haspiel, really complements the writing perfectly. Rather than being in full colour, it's told in black and white with splashes of pink and red, mainly used for dresses, roses, and for blood. It's a visually arresting style which is significantly easier to read than normal black and white and which seems to add to the horrors of what Sonya is going through. Strong recommendation, particularly to fans of historical autobiographies and of graphic novels.